While continuing our review of preventative maintenance it seems as though there are numerous flushes and services that should be done on your vehicle, it’s important not to get overwhelmed with these procedures. It is our goal in reviewing the preventative maintenance procedures to help make the public more aware of these items and to help save you money on costly automotive repairs. Furthering our journey into preventative maintenance another vital procedure is a Differential Service. Some people believe that just because their vehicle is front wheel drive or all wheel drive that they don’t have differentials. This is actually not true, front and rear differentials can be on an all wheel, front wheel and rear wheel drive vehicle. For most procedures your vehicle needs done in regards to preventative maintenance you can usually find out when your vehicle is due for maintenance in your vehicles owner’s manual. As a general rule of thumb most vehicles should have their Differential Service done within the first 100k miles. A Differential Service is where your ASE Certified Technician drains and replaces the oil in the Differential. 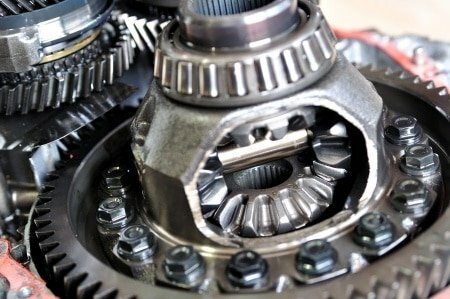 In some vehicle the Differential can only hold 1qt – 1 ½qts of oil. Considering this is a very small amount of oil keep in mind if you have a leak it could be detrimental to your vehicle! We advise to steer clear of cheap oil products as well because cheaper is not always better. Your ASE Certified Technician should be able to recommend the right oil for your vehicle which is another reason why it’s vital to choose the right shop for your automotive repairs. This oil is used to lubricate bearings, spider gears axel bearings and it’s also used to cool these components down and prevent pre-mature wear. If you can keep up on this particular preventative maintenance procedure all the bearings and spider gears will most likely last the entire life of your vehicle without having to be replaced as long as your vehicle is not subject to abuse. Abuse in this case simply means you are not overloading your vehicle, neglecting your vehicles oil levels or allowing it to leak consistently without repair etc… As always when you have any repairs done to your vehicle we always advise to keep your invoices for your records. We hope all of you have enjoyed our articles and have found them helpful. Should you have questions or would like to set up a time to bring your vehicle in for maintenance or repair work, please contact our shops. We have shops in Surprise and Goodyear. Or call 623.376.6791 (Surprise Shop) or 623.882.8200 (Goodyear Shop). We look forward to servicing your vehicle.